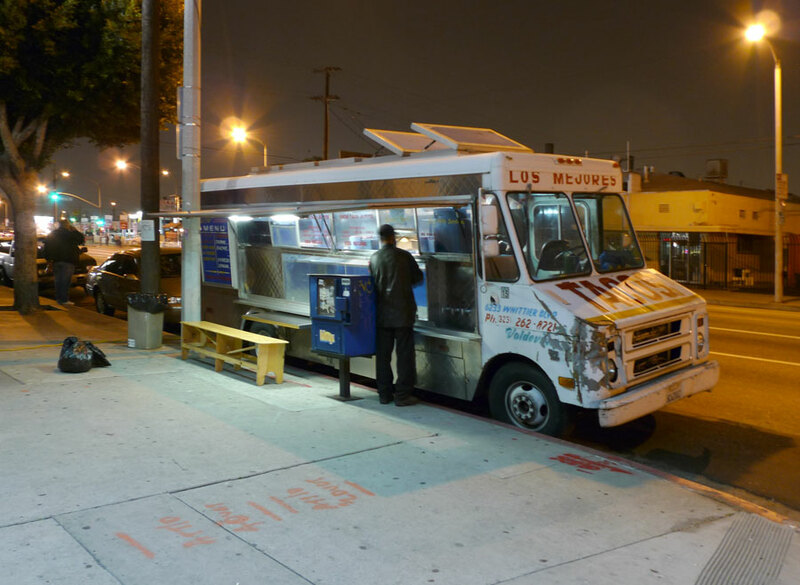 I feel born again, basking in taco-given grace, after my stop at this ordinary-looking East LA taco truck on my way home from work, my first taco truck of the year. After reading a review of this truck on the Great Taco Hunt blog, I had high expectations from La Flor de Sahuayo, but I was rewarded! Unwrapping my two tacos and after snapping a photo taking that first bite, I felt like a taco virgin once again. Yes, despite the fact that I was raised in California, I don’t think I had a real taco, or knew what a taco was, until after I finished college. 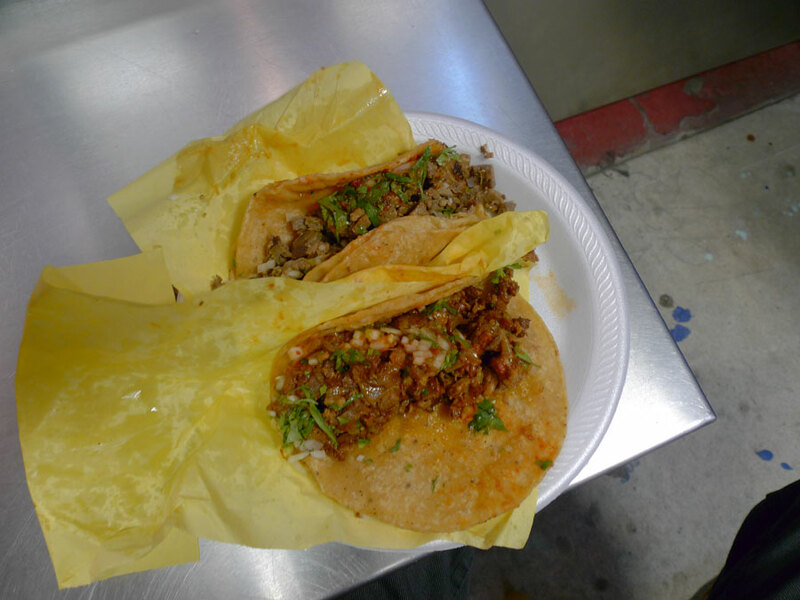 Moving to Santa Ana in my early twenties, I gradually became aware of the gift that was all around me – cheap, delicious tacos! Not crunchy, cheesy, sour-creamy, sludgymeaty things, but elegant little concoctions of meat, cilantro, onion and tortilla. As diagrammatically pure as the noble Hamburger or Pizza Pie. Taking my first bite of my Flor de Sahuayo al pastor taco, I remembered how I felt a decade ago when I first discovered the taco. A revelation! I ordered one al pastor and one carne asada taco, at $1.50 each. These tacos are huge – I think the photo gives a sense of the scale, as that’s pretty much a normal-sized plate. I was satisfied by two tacos (although I would have eaten a dozen more if they had been in front of me, shortly before expiring). As Rem “Cabbagerabbit” Koolhaas reminds us, size is in and of itself a kind of quality; so it is with tacos. After that first big bite, so much taco remains, and you revel in the fact that it’s going to just keep on coming at you. You take the next big bite, no need to take a small one to savor the moment. The luxury of so much meat warms your soul and guts. And with the al pastor, at Flor de Sahuayo they have perfected an alchemy wherein they transform flesh into gold, tasty tasty gold. The meat is juicy, spicy, fruity, savory, grilledoniony, with a rich chewy texture and a pleasing oiliness. The meat was matched by the awesomeness of the tortillas, unlike any I have encountered – bilaminated, very yellow, thick, and strongly corn-flavored. They reminded me of the corny outside of taquitos in flavor, but not crispy. The carne asada was next, and contrasted wonderfully with the al pastor. The al pastor was a complex mystery, the carne asada a pure expression of lightly seasoned and grilled flesh. It tasted exactly like carne asada. When you’ve finished your tacos, the sadness is tempered by the fact that overflow meat, spilled out the end of a taco onto your plate, is waiting to be picked up with oily fingers and shoved into mouth. A delight. Now I’m wondering what else East LA’s taco trucks and taco stands hold for me. Will it all be this good? A life without tacos is a life less lived, brothers and sisters. I may one day burn for the cabbage rabbit translation. I want to experience grilledoniony.